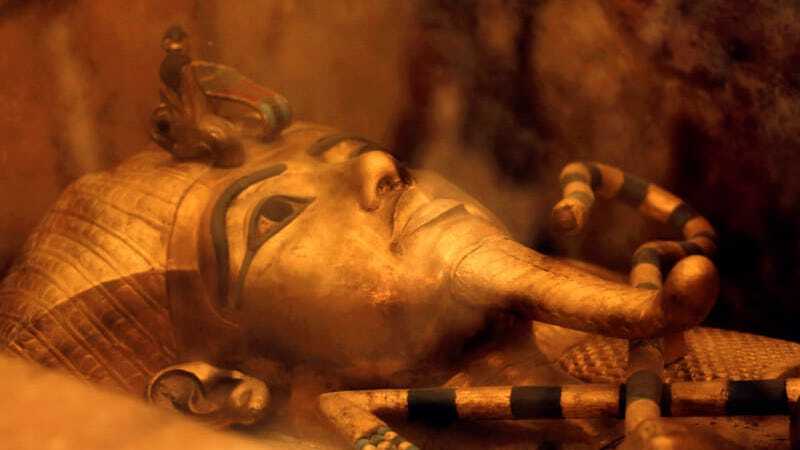 Tutankhamun, the boy king of ancient Egypt who died at 18 and later exploded inside his own sarcophagus, apparently owned—and was buried with—a literal space dagger made from meteoric iron. “Only one [meteorite], named Kharga, turned out to have nickel and cobalt contents which are possibly consistent with the composition of the blade,” she added. The meteorite fragment was found in 2000 on a limestone plateau at Mersa Matruh, a seaport some 150 miles west of Alexandria. Objects made from the metal of meteorites were probably considered extremely valuable in ancient Egypt, but they also reveal the sophistication of smithing during that era of human history. And the blade was not the only object in Tut’s tomb made from an unusual and rare material: a scarab necklace he was buried with is believe to be silica glass, caused by the impact of another space rock smashing into the Libyan desert and melting the nearby sand. We’re still finding new things in King Tut’s tomb, but each discovery seems to reveal that the kid had great taste. The dagger is now on display at the Egyptian Museum in Cairo.